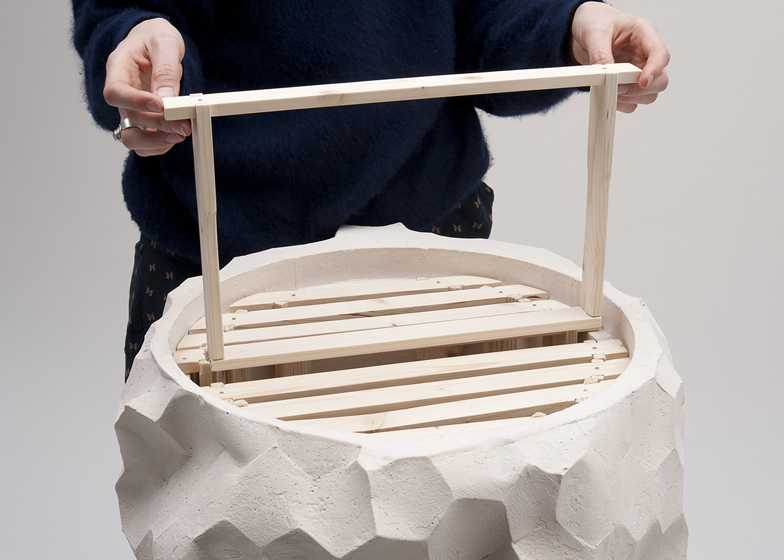 Design graduate Bettina Madita Böhm has created a cylindrical concrete beehive for urban beekeepers to use on the roofs of city buildings. Bettina Madita Böhm designed the Apiarium hive as part of a council initiative in Berlin to install beehives in unused public spaces and encourage more people to learn how to keep bees in urban environments. A critical decline in bee populations has caused concern globally, as the insects are relied on to pollinate more than three quarters of the world's food crops. This week, a Harvard study linked the loss of bees to a rise in the use of neonicotinoids, pesticides commonly used by farmers to protect their crops. The future of the European honey bee population may rely on the work of beekeepers, Bettina Madita Böhm told Dezeen. "For the bees, the life conditions in cities are often better than in the country side, where the industrialised agriculture makes their survival as wild animals impossible," Böhm continued. Böhm used the project as the focus for her bachelor's degree at the Free University of Bolzano in Italy, which investigated possible solutions for beekeeping in modern metropolises like London and Berlin. "People are encouraged to merge into a meaningful avocation in relation to nature, while simultaneously improving the ecology of the city," Böhm explained. The hive is cast in light concrete, containing air canals to insulate it in colder seasons. At the base, a cylindrical chamber provides space for the bees to nest. "The round shape of the hive is inspired by the hollow tree trunk, the typical natural habitat of the honeybees," Böhm said. As the hive grows and the bees start to form the honeycomb, an extra chamber with a hexagonal pattern is added to the top. Wooden frames fitted across the chamber can be removed in the summer months for harvesting the honey, similar to the traditional system of bee farming. A flower pot sits atop the hive to attract the bees and encourage pollination, also acting as a cooling device in the summer. "Beekeepers sometimes use colour coding or big wooden flowers to help the bees orientate. The plant helps the bees distinguish their hive from other hives that might stand next to it and to help them find their way home," Böhm said. The humble bee has become a popular subject for architects and designers. At last year's Dutch Design Week, Portuguese designer Susana Soares unveiled a device for detecting cancer and other serious diseases using trained bees. Tomáš Gabzdil Libertiny of Studio Libertiny has created series of Honeycomb Vases, which are made by bees, and last year the University at Buffalo launched a competition to design a new home for a hive that had taken up residence in an office building and needed to be moved. Photography is by Bettina Madita Böhm. Read more stories about insects on Dezeen, including a Fly Factory that produces pate for human consumption and a plastic made from pressed beetles.